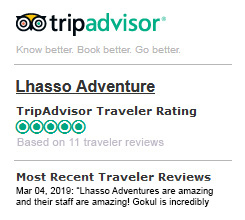 Our Commitment - Lhasso Adventure Pvt. Ltd.
We understand that one’s personal information is very important to them. So, we do not want to make our clients feel insecure and worried when they provide us their detail information while filling various forms for the trip. We have strong protection over the social security numbers, phone numbers, addresses, passwords or other personally identifiable information of the client. We encourage you to enjoy your time to the fullest while you are here, as we assure to keep them secure without any leakage. Lhasso Adventure is committed to provide best quality service to its valuable clients from the time of their arrival to departure. In every tip, we strive to work innovative to deliver better service, which our clients can trust and be reliable. Our services are on top- notch whether in terms of correspondence response,answered to your queries, tour leaders and guides, accommodation, or networks. We are here to assist in any possible way we can to help our clients 24/7. We are focused to work in such a way that helps to create an Eco-friendly environment in tourism. We try to minimize things that negatively impact the Eco-system, culture and environment of the places we travel. We help to bring economic development in the region as we work with the local hotels and buy local handicrafts in our tours. Additionally, we fund charities to the non- profit organization, MCAF, that works to empower women, establish educational infrastructures and organize medical camps in remote communities of Nepal.